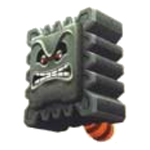 Tail Thwomp is a Thwomp with a Tanooki tail that appears as an enemy in Super Mario 3D Land. They act very similar to Grindels and Thwimps. Tail Thwomps can jump about in a wide set area, unlike the regular stationary Thwomps. When they float, it is reminiscent of the way Tanooki Mario floats, complete with the accompanying sound effect. Unlike some Thwomps, Tail Thwomps have a face on only one side, due to the tail on their back. Tail Thwomps can be defeated if Mario transforms into Statue Mario and either lands on them or has them land on him, like normal Thwomps. There are only two Tail Thwomps in the entire game, and they both appear in World 5-1. In Mario & Luigi: Partners in Time, one of the Tanoomba and Tashrooba's attacks involves turning into a Thwomp with a Tanooki tail in midair and slamming to the ground. This page was last edited on November 27, 2017, at 07:32.